Pro Coatings Solutions are specialists when it comes to providing high quality, on site finishes and more detailed finishing repairs for commercial premises. We were recently asked to help in the rebranding of Nisa Forrest Hall. This involved respraying a shop counter and repairing the finish on a series of promotional panels. 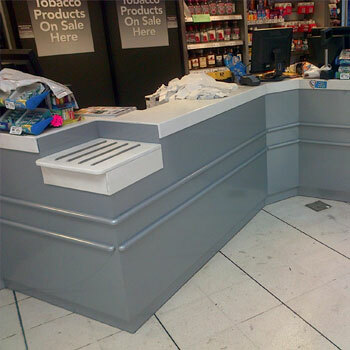 The first part of the project required us to respray a shop counter from a very dark blue, to silver; matching the NISA Store’s new colour scheme. Thanks to the exceptional experience and skills of the Pro Coatings Solutions team this presented no real problem to us. Respraying commercial counters is something we excel in. High pressured deadline: one evening! Due to the fact that the premises is a busy shop during the day, we were required to complete the work during the course of one evening. This was to prevent disruption to any customers, or staff during opening hours. Working in the evening meant that the Pro Coatings Solutions team had a very tight deadline: all of our work had to be completed in one night or else we would risk disturbing the shop during the next working day. Thanks to our industry-leading painting team, time was not a problem. We completed the respraying to an exceptional quality, well before the deadline. The other part of the project was the repair of a series of promotional panels. They had suffered extensive damage. This meant that we were required to repair them in-situ, at our state of the art, Sunderland-based factory. Our dedicated team of experienced painters and repair specialists were able to get the panels looking as good as new in two days. To achieve this, a base finish was applied to the panels to then receive the colour change from the previous yellow, to the new silver. This matched the colour of the counter perfectly.